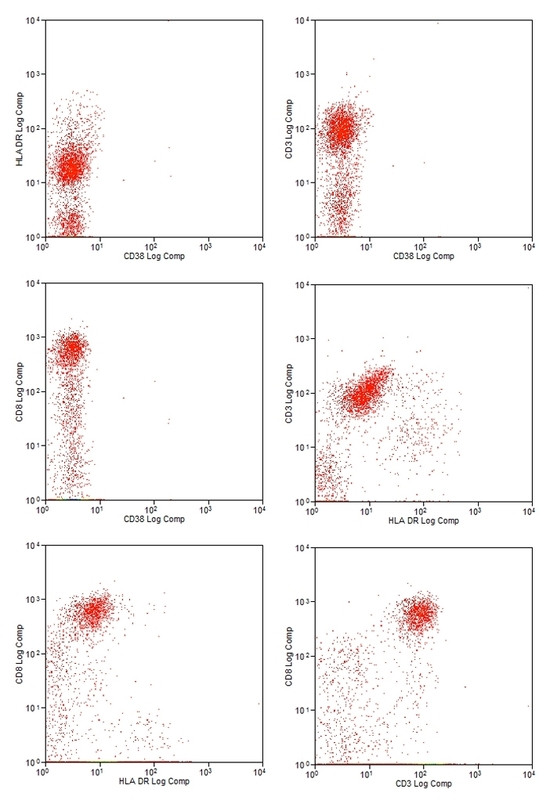 Human peripheral blood lymphocytes stained with Multi-Colour Human CD8/ CD38/CD3/HLA DR flow kit (4C004). Four-Color Human Flow Kit, CD8/CD38/CD3/HLA DR, clones LT8 / AT13/5 / UCHT1 / YE2/36-HLK can be used for single-step identification of human activated cytotoxic (CD3+CD8+CD38+ and CD3+CD8+HLA DR+) T-cell subsets, useful in the study of Acquired Immunodeficiency Syndrome (AIDS) and other viral infection including Epstein Barr Virus (EBV) and Cytomegalovirus (CMV). CD3 is a member of the immunoglobulin superfamily, which acts as a mediator of signal transduction, through association with the α/β or γ/δ T-cell receptor (TCR). Mammalian CD3 is a multimeric protein composed of four distinct polypeptide chains (ε, γ, δ, ζ), consisting of two heterodimers (εγ, εδ) and one homodimer (ζζ). CD3 is expressed by a high-percentage of circulating peripheral T-cells and is considered a pan T-cell marker. Clone UCHT1 specifically recognizes the 20kDa CD3ε chain. CD38, otherwise known as cyclic-ADP ribose hydrolase 1, is a type II integral transmembrane glycoprotein and member of the ADP-ribosyl cyclase family, which is widely used to study the processes of B- and T-cell differentiation and activation. An increase in CD8+CD38+ T-cells is a useful indicator of disease progression in HIV infection. This same subset of activated T-cells is also increased in other active viral infections such as EBV and CMV. HLA DR is a heterodimeric cell surface glycoprotein and human class II MHC (major histocompatibility complex) cell surface receptor, consisting of a 36kDa alpha and 27kDa beta chain, which is essential for efficient peptide presentation to CD4+ T-cells. HLA DR is expressed primarily by antigen presenting cells and, together with CD38, is a useful marker of T-cell activation following viral infection. Clone YE2/36-HLK recognises a monomorphic determinant of human HLA DR.